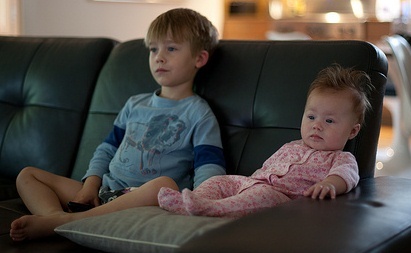 Despite warning by the American Association of Pediatrics more and more toddlers are spending an increasing amount of their time in front of television screens. Contrary to what many parents would like to believe, it does not, in any manner, benefit them. The modern day parents are so busy with their work that they are finding it in increasingly difficult to spare even a few hours with their children. To overcome their guilt, they give in to their children’s demands easily. The result is that even small toddlers have their own cell-phones and computers with the latest apps, as a means of entertainment. This is apart from the television set in the kids’ room, which has almost become a norm. The makers of these apps promise to improve the child’s educational abilities through these games. How successful they are in doing this is not yet known. However, parents with fat purses are increasingly swayed by these promises. And since, they themselves cannot spend quality time with their children; they tend to download these apps for their children. The thinking behind this is that at least the children will not waste their time watching television programs. On the other hand, parents with an annual income less than $ 30,000 do not have the disposable income to download these educational soft wares. Only one in eight such families was found by the survey to download these educational apps for their children. Even though the parents in these families cannot spend time with their children, they are content installing a television in the kids’ room. Thus, we see an emerging app gap between the families. A study by Edward L. Swing, Douglas A. Gentile, et al, published in the journal Pediatrics, has found that spending more time in front of the screen can lead to subsequent attention problems in children. The study analyzed the amount of time children spent in front of the screen and its relationship with their mental health. 1,323 school going children were studied for a period of 13 months. Their parents and teachers were interviewed about any attention problems that they were facing in the school. Similarly, reports were collected from 210 college going students about their television and video games habits and whether the faced any problems in the college. It was concluded that the children who spent more than 2 hours in front of the screen had 1.2 to 2 times more likelihood of developing attention problems. It has been seen that an average American spends much more that 4.26 hours per day in front of the screen. This has been found to have an impact on his attention span. The American Association of Pediatrics recommends not more than two hours per day in front of the screen and has urged all pediatricians to emphasize on this fact whenever they meet the parents. However, either the pediatricians fail to do so, or their recommendations are taken lightly. Parents consider themselves to be better informed about this and think that their children actually benefit using these educational apps. However, this belief is just a myth which has not been corroborated by any research. Therefore, think hard the next time before downloading any apps for your children. You may be inadvertently causing them more harm than good.